While traveling in Calgary, Alberto Manguel was struck by how the novel he was reading (Goethe’s “Elective Affinities”) seemed to reflect the social chaos of the world in which he was living. An article in the daily paper would suddenly be illuminated by a passage in the novel; a long reflection would be prompted by a single word. 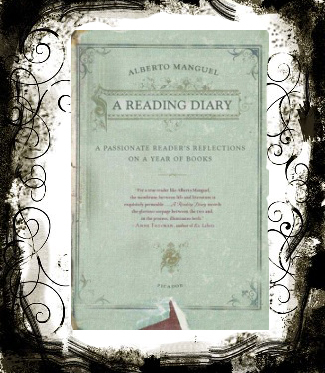 He decided to keep a record of these moments, rereading a book each month, and forming “A Reading Diary”: a volume of notes, reflections, impressions of travel, of friends, of events public and private, all elicited by his reading. From “Don Quixote” (August) to “The Island of Dr. Moreau” (February) to “Kim” (April), Manguel leads us on an enthralling adventure in literature and life, and demonstrates how, for the passionate reader, one is utterly inextricable from the other. Setelah membaca Tolstoy and the Purple Chair gue nagih baca buku sejenis, tentang reading journey dan bagaimana buku bisa mengubah hidup seseorang. Gue punya rencana tahun depan untuk fokus membaca selama 1 tahun tanpa gangguan apa pun (stop nulis dulu). Selain mau menghabiskan TBR pile yang menumpuk, membaca juga bisa dapat inspirasi/referensi untuk menulis. 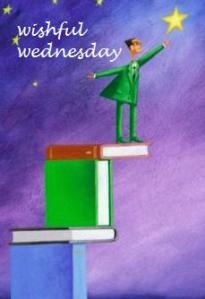 Seperti biasa, yang mau ikut Wishful Wednesday, langsung aja klik Books to Share. Posted on April 24, 2013, in Uncategorized and tagged bloghop, book, Meme, non fiction, Wishful wednesday, wishlist. Bookmark the permalink. 9 Comments. buku tentang penggila buku, pasti menarik ya mbak. Salam kenal 🙂 Iya, seru banget baca buku semacam ini. Aku masih terpesona sama buku Tolstoy & the Purple Chair. Seru baca pengalaman sesama pembaca buku berbagi kisah serunya membaca. Oh wowww! covernya keren, sinopsisnya juga bikin penasaran..buku kayak gini yang bikin kita terinspirasi untuk terus baca dan nulis ya… semoga bisa dapet yus, dan semoga rencana full baca nya taun depan sukses ya!